In 2003 an evaluation of AlGaAs Laser Diode Arrays at NASA Goddard Space Flight Center revealed “Metal Whisker Formation” emanating from the reflowed eutectic Tin-Lead solder die attach material (Sn63Pb37). Evidence of electrical shunts created by these whiskers was also confirmed. Whiskers composed of both Sn and Pb up to 30 microns long were observed. In this particular device application the whiskers were of sufficient size to short the heat sink to the active region of the AlGaAs semiconductor (shorting distance is only 2 to 3 microns). In general, metal whiskers originating from Sn-Pb coated surfaces are rare, especially if the materials have been reflowed as is the case in this device application. When observed, such whiskers are generally reported to be much smaller than whiskers found on mostly pure tin coated surfaces. 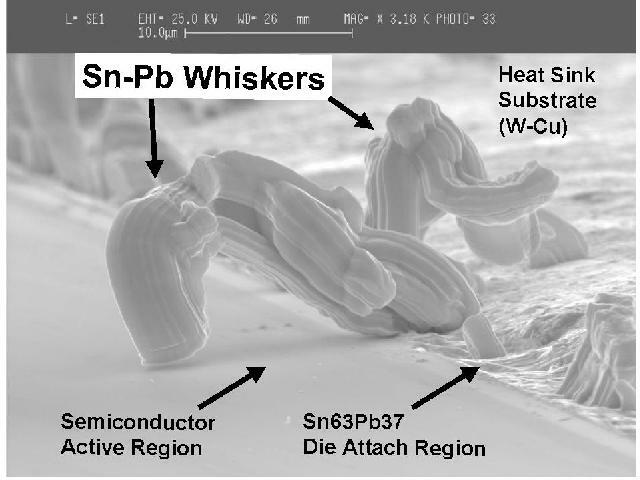 A review of published literature on Laser Diodes reveals that similar metal whiskers have been reported for various die attach materials including pure Sn, Sn-Pb (63-37), Indium and Sn-Au (90-10). The researchers contend that ELECTROMIGRATION of the die attach materials may be induced by the very high current densities (on the order of 10 ^ 4 Amps/sq-cm) that these devices may experience in application.